What's missing? : Is There A Problem Here? : What's missing? 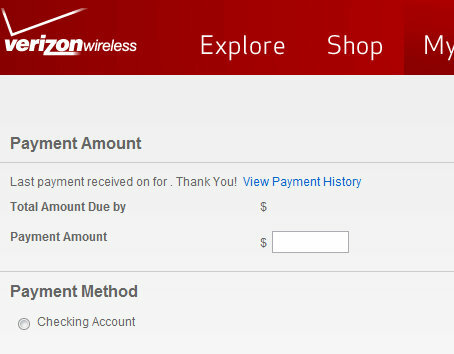 Verizon Wireless continues to robo-call me demanding I pay amounts not yet due or they will shut off my service today. I try to access the web site to try to pay them something to see if that might stop the threatening calls. Attempts to login to the web site are met with a page stating I can't access my account due to Unprecedented Demand -- the same problem I had paying the bill last month. Later in the day, I try again. This time I can login to my account, select the bill pay option, enter an amount and account from which to pay... but then, when I close the "Verified by Visa" window that is part of the payment process, all my info disappears and the following is displayed. Can you see what's not there? I think there's a problem here.